By all accounts, business is good for the makers of Tower of Saviors. Last October, Tech In Asia reported that the smartphone game had passed the 7 million download mark with an average revenue per paying user of US$40. 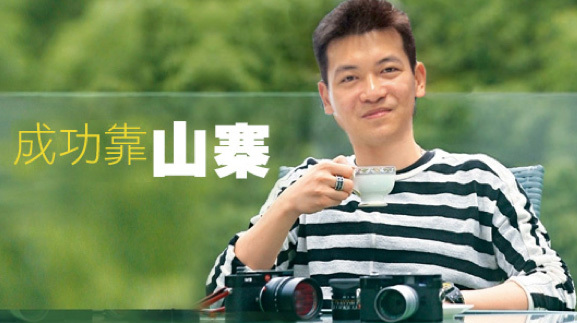 And in March, Pocket Gamer reported that China game publisher Forgame paid over US$ 90 million for a 21% stake in their parent company. But behind the commercial success is a mob of really, really angry netizens; they believe that Tower of Saviors is a shameless clone of Puzzle & Dragons. 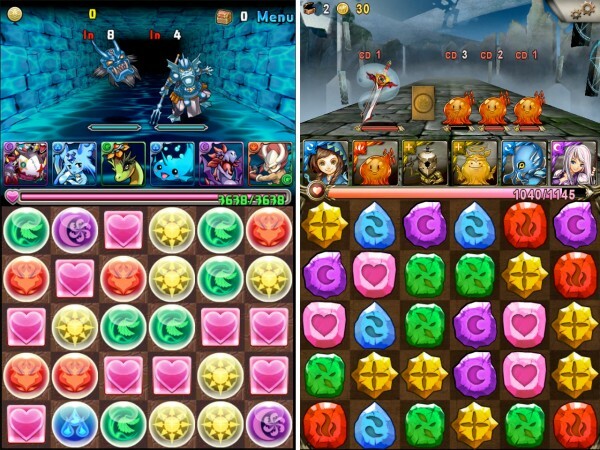 In case the image at the top of this article isn’t clear enough, EVCHK has three more examples of the similarities between Japan’s Puzzle & Dragons and Hong Kong’s Tower of Saviors. 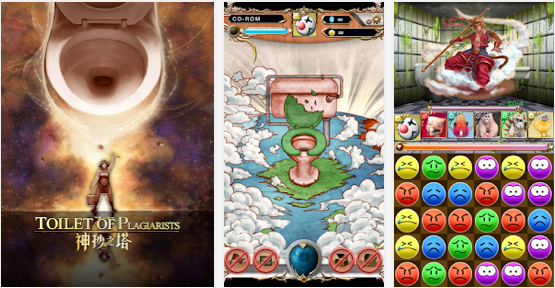 Screenshots of “Toilet of Plagiarists” from the Google Play Store. During the early rise of Tower of Saviors just over a year ago, Hong Kong legislative councilor Charles Mok was caught lauding its creators in Sky Post for their “work hard play hard” attitude and seizing the opportunity of Puzzle & Dragons’ not releasing a non-Japanese version. Two days later, Charles wrote a lengthy retraction in the Hong Kong Economic Journal, citing Facebook commenters who had pointed out the fallacies of his earlier article; including one who even went as far as to “unfriend” him in anger. But within these two days, Charles had done his homework. First, there are over 20 Puzzle & Dragons clones, which makes the Tower of Saviors unremarkable in its mimicry. (Though it did disturb him that he publicly supported copycats.) Then, he found out that the Tower of Saviors creators were previously involved with Pencake, a Facebook app company that was banned from Facebook for its unscrupulous business practices. Upright politicians and diehard netizens aside, most people actually don’t care. One of the most common questions asked about the topic is simply: which game is better? And Puzzle & Dragons lost points early by only being released in the US and Japan app stores, which insulted gamers and pushed them into the arms of its clones. Unfortunately, cloning games is not an uncommon practice; casual gamers are pretty forgiving about it. One recent example was for the breakthrough puzzle game, Threes, which was created in the US; then promptly cloned as 1024 in Beijing; which was in turn cloned and open sourced as 2048 in Italy – much to the dismay of its original creators who had labored on it for over a year. Giant Bomb compares 1024 with 2048 with Threes. One of the major underlying problems is that there’s no clear or easy way to “copyright” a game (though it is possible to throw money at the problem in the form of flimsy software patents). As such, it’s usually technically not illegal to clone and sell a game. Only time will tell whether Puzzle & Dragons and Towers of Saviors will succeed over the other, flop entirely as a fad or co-exist in the marketplace. It’s possible that the original’s design will remain superior and “crush” its clones. 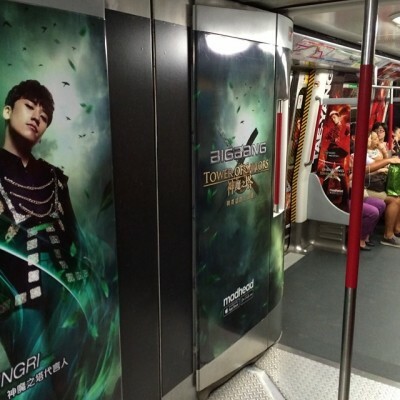 But it’s also possible that the clone’s significant marketing budget (Korean pop stars, etc.) will allow them to buy out entire markets. What is already happening is that another Hong Kong-based game publisher, 6waves, is under fire for cloning smartphone games. It’s already lost its case once, and it’s slated to appear in court in San Francisco for another batch of products. Will Tower of Saviors follow a similar fate in the courts one day?